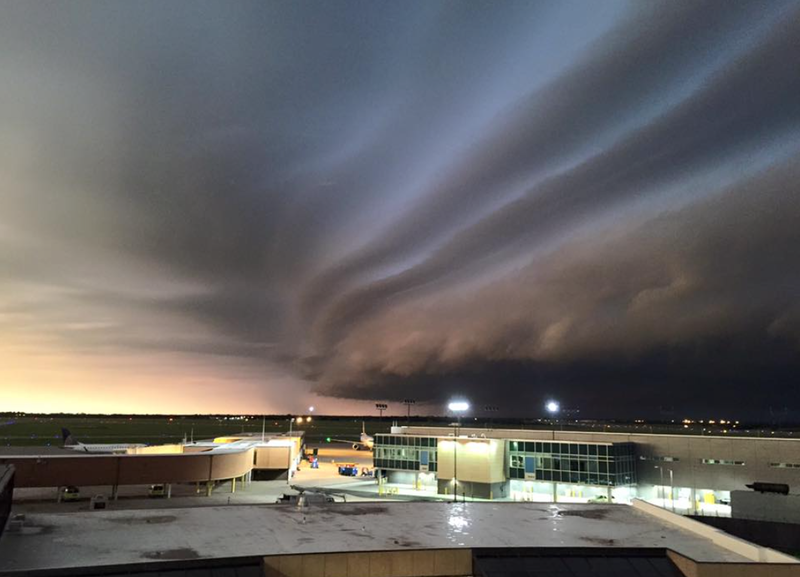 Photo of this morning's storm moving across Eisenhower National Airport in Wichita. 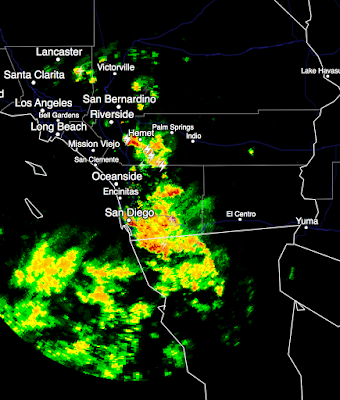 Great soaking rain and lot's of lightning; which converts the rain into liquid fertilizer. ...taken from 700+ miles away. This is really amazing video of a rare phenomena. Enjoy! Sprites and Meteors, 26 July 2015 from ZT Research on Vimeo. Massive sprites and a few meteors captured with a Watec 901H2 Ultimate low light camera from Rapid City, South Dakota on the night of 26 July 2015. Sprites are huge electrical discharges in the upper atmosphere that start about 60 km in altitude and extend both upward to 90 km and downward to 20 km. They occur when a large cloud-to-ground lightning flash takes place in a large storm system below. Typically, a large negative field change caused by a horizontally extensive positive cloud-to-ground flash initiates bipolar/bidirectional electrical breakdown of the rarified air in the upper atmosphere. Positive streamers travel downward and negative streamers travel upward. They can be seen up to 700 km away with a low light camera and good view conditions. 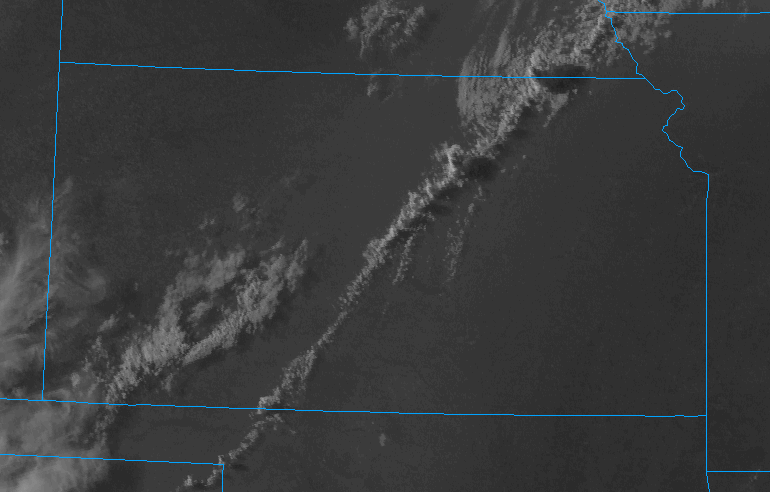 The sprites captured in this video ranged between 400 - 700 km (south central Nebraska to northcentral-northeastern Kansas). 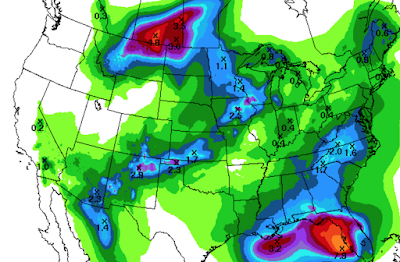 Want to see what a combination commercial weather company and television weather department? 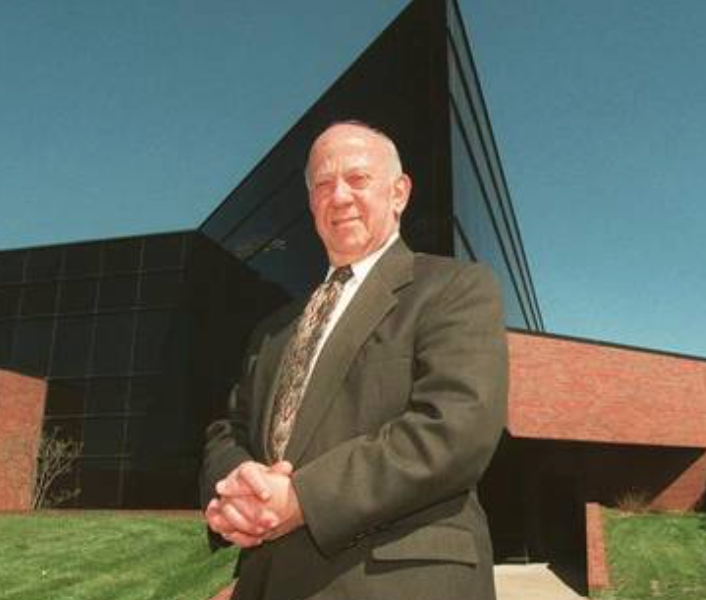 Here is a video I happened to run across taken at WeatherData, Inc. in 1987. There is a tornado watch for South Dakota. 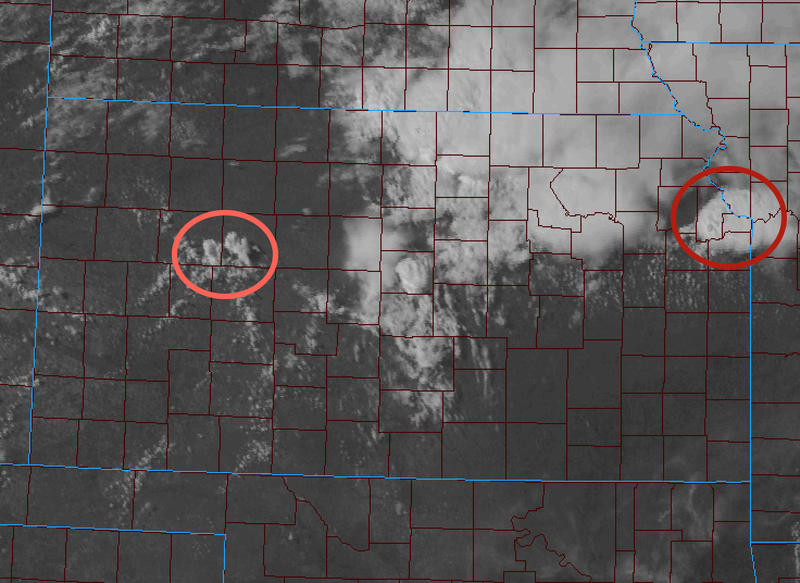 There is a downburst producing thunderstorm (red circle) in Johnson Co., Kansas, and a chance the storm in western Kansas could produce downbursts or a brief tornado in the next hour or two. Drones that fly into hurricanes at low levels. Arctic ice stops another global warming expedition. "The worst in 20 years"! You have probably seen the news stories about the huge fire in New Jersey in progress. Here is the radar image of the smoke plume. 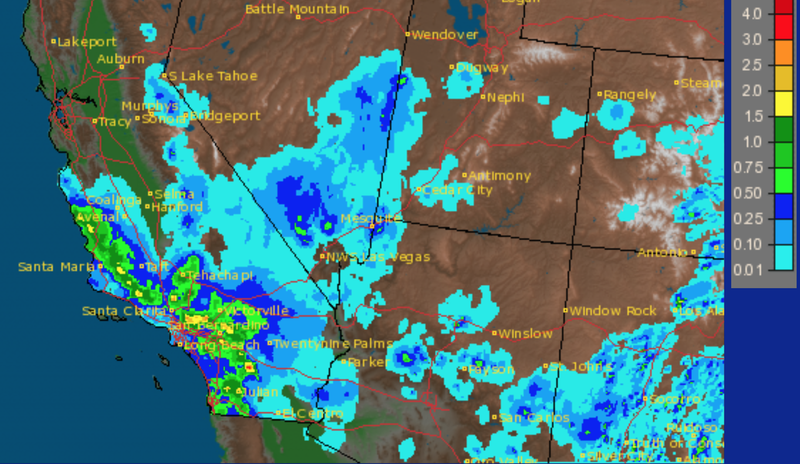 In the Southland mountains, as much as 3-4 inches fell. This rain is highly unusual for mid-July. 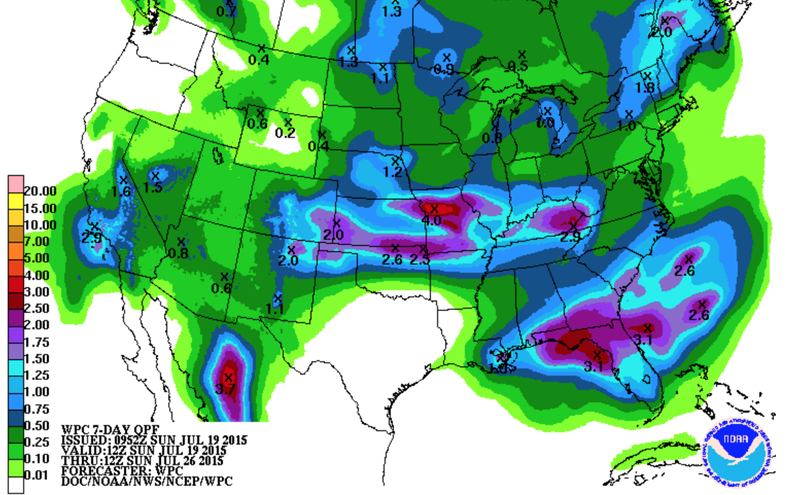 The entire rainfall from the tropical storm (7-day totals) is depicted below. 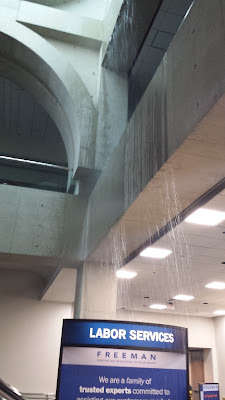 In most areas, the rain was extremely welcome. It did come at some cost, however. There were people injured in a lightning strike, a bridge on Interstate 10 washed out and there were several railroad washouts. Moisture is moving north with the remains of a Pacific tropical storm with more flash flooding likely this afternoon and tonight. 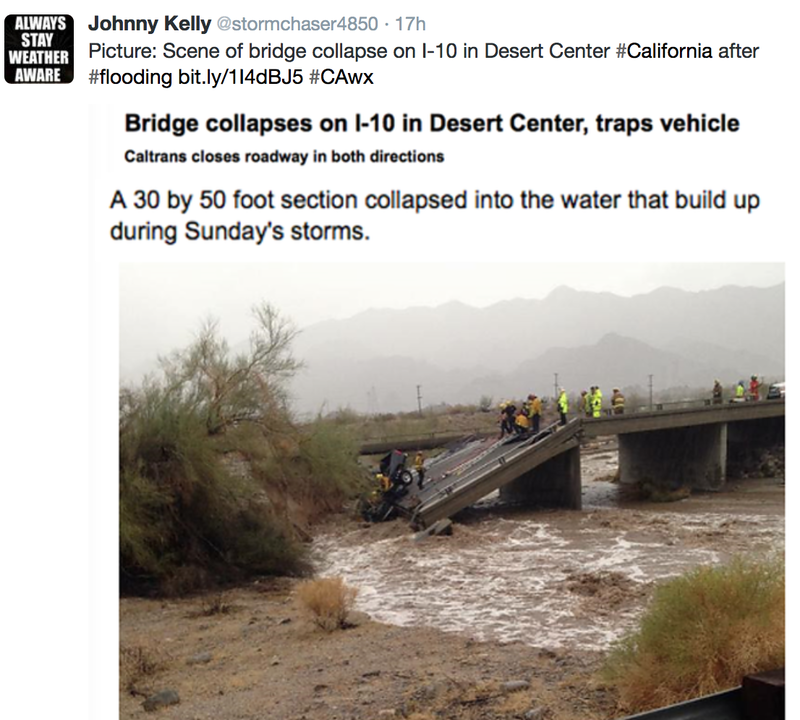 So, I urge Southland readers not to cross flooded areas by foot or by car! Just last night, a pregnant woman and her son were killed doing just that. 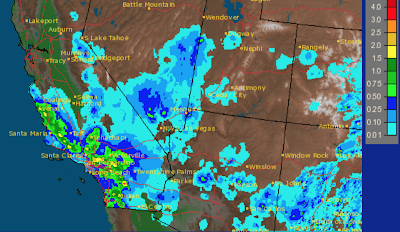 Here is the AccuWeather Regional Radar at 3:45pm CDT. San Diego normally receives 0.03 inches of rain in the entire month of July. They've received 0.52 today with more on the way. 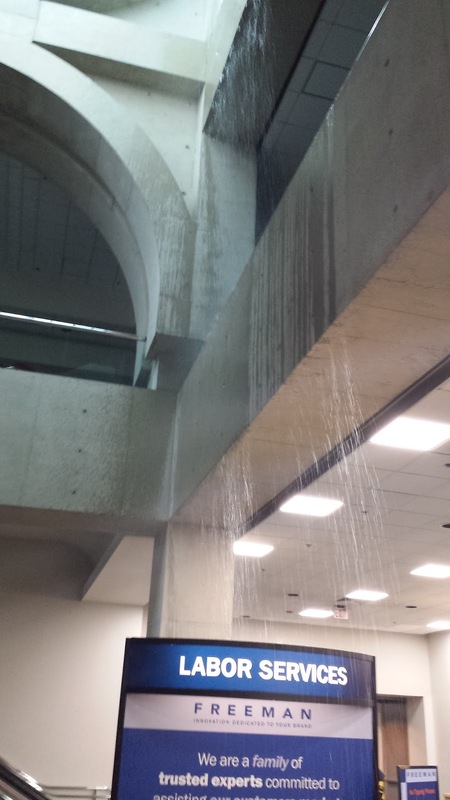 Here is the photo of the leaking roof inside the San Diego Convention Center. An Alaska Airlines jet had to make an emergency landing at LAX due to being struck by lightning. All aboard are safe. 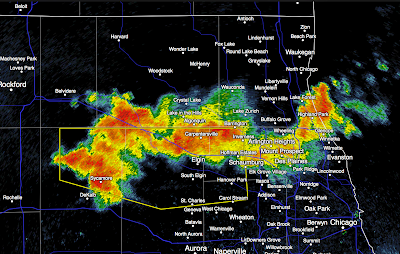 Strong thunderstorms are in the Chicago-Milwaukee areas at the present time. 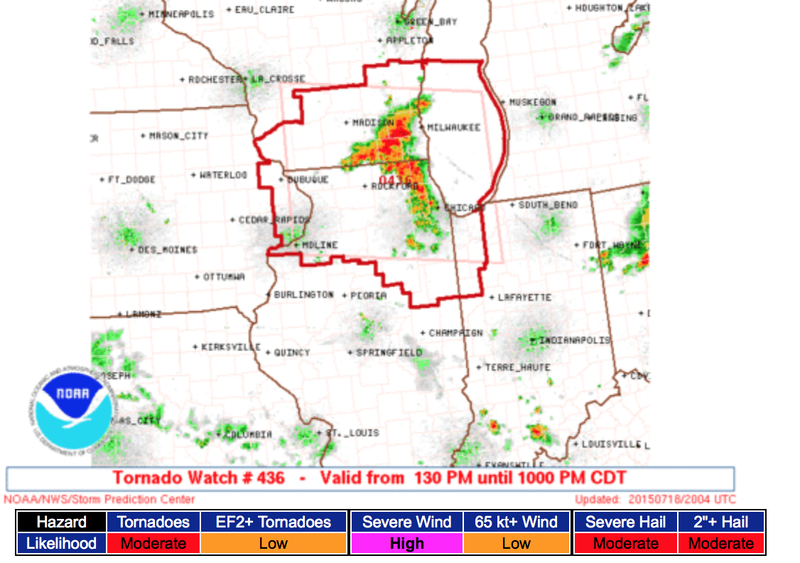 ...and, in Milwaukee and west to eastern Iowa. A Nickerson, Kansas, family survived the EF-3 tornado unharmed in the safe room photo at right. More on their story, here. 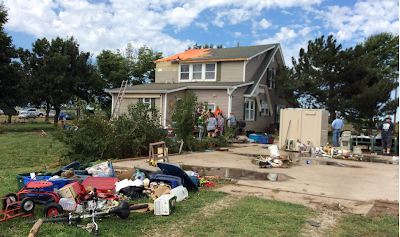 If you live in Tornado Alley and do not have a safe room, it is a valuable investment. BUMPED due to more information. This was July 6, not far from my home. There was one clap of thunder during the storm that was extremely loud. I imagine it was this bolt. According to today's Wichita Eagle the car was fried and the cars around it were damaged due to the strength of the electric current in the lightning. You've undoubtedly read the news about the two reports predicting serious global cooling starting in about 1-2 decades. Here are some words of wisdom from Dr. Roger Pielke, Jr.
One area of controversy has to do with the reliability of computer models of the global climate system. 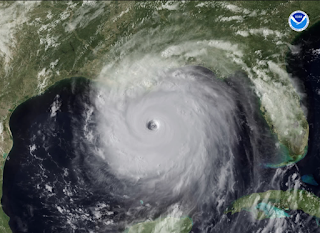 Can they accurately predict future climate change? At this point, the answer is no. Predicting the climate of the next century with precision is impossible. 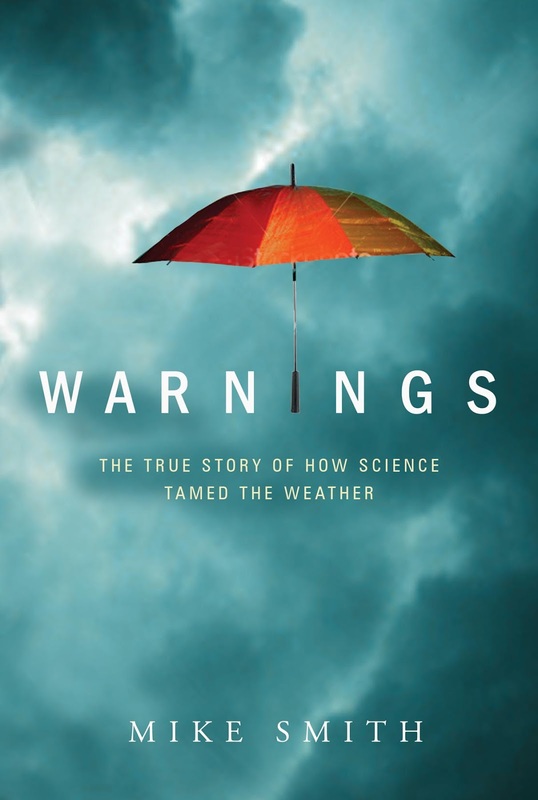 Scientists and the news media must take care to better educate policymakers about the process of science, and in that effort, scientists must also be careful about the words they use. Policymakers must beware those who talk about ``climate predications;'' no one knows how to accurately predict climate. My advice, stop worrying about climate change. Roger is correct: We don't know how to predict it and we certainly don't know how to change it. 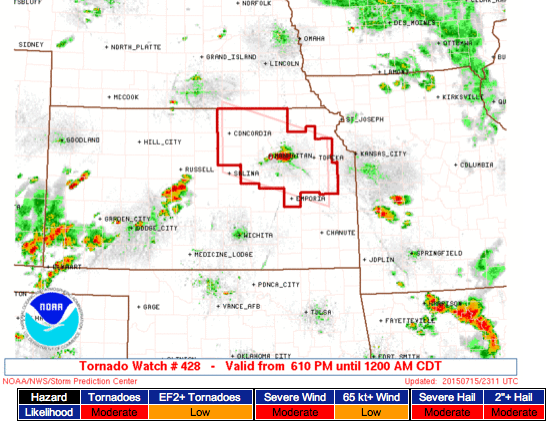 A tornado watch is in effect until midnight tonight for northeast Kansas. 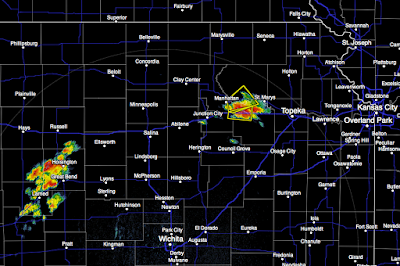 It includes Topeka and Manhattan. Here is the radar at 6:06pm. It is in the mid-Missouri River Valley and includes Omaha. Please keep an eye on the weather in this area. 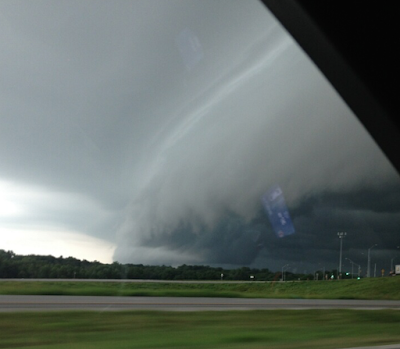 Nice photo of a shelf cloud taken by Alex Biel near Olathe, Kansas, this morning. Just when you think it can't get any more surreal. If Jane Fonda and the rest attain their climate goal, they will accomplish nothing more but create more poverty. Good luck with that. 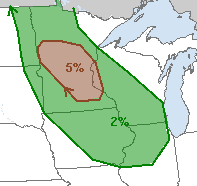 The 5% area is where there is a significant risk of tornadoes today and this evening. Please keep up on the weather in your area if and when thunderstorms approach. Here is the radar at 10:16pm that shows thunderstorms moving southeast through the Chicago area. 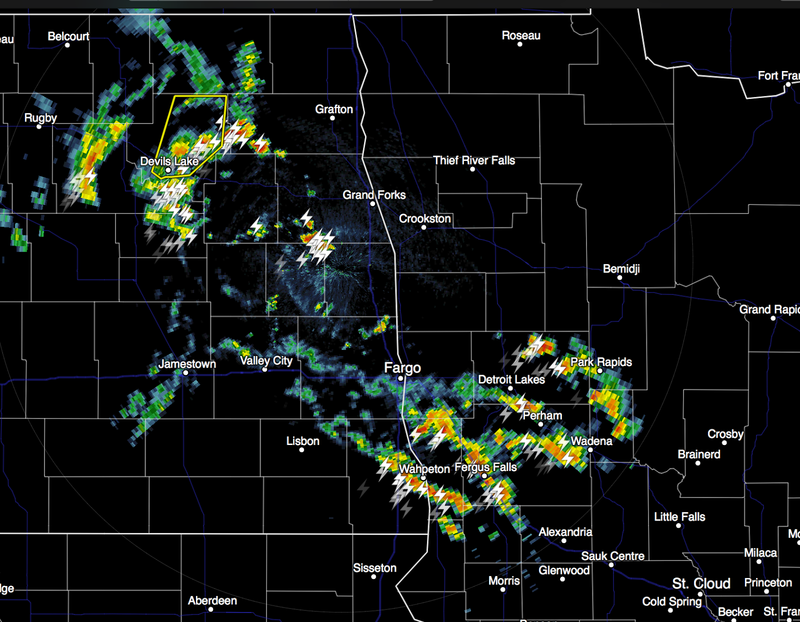 Strong wind gusts will accompany the storms as they move rapidly southeast. 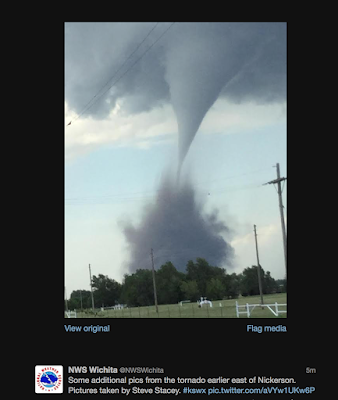 Here is the quintessential Kansas tornado photo, via Twitter. This is the storm earlier this evening near Hutchinson. This wraps up my storm coverage for the day. 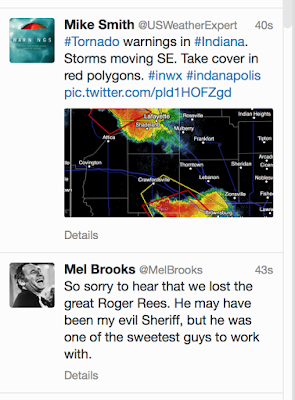 Mel is one of my heroes. A true original. 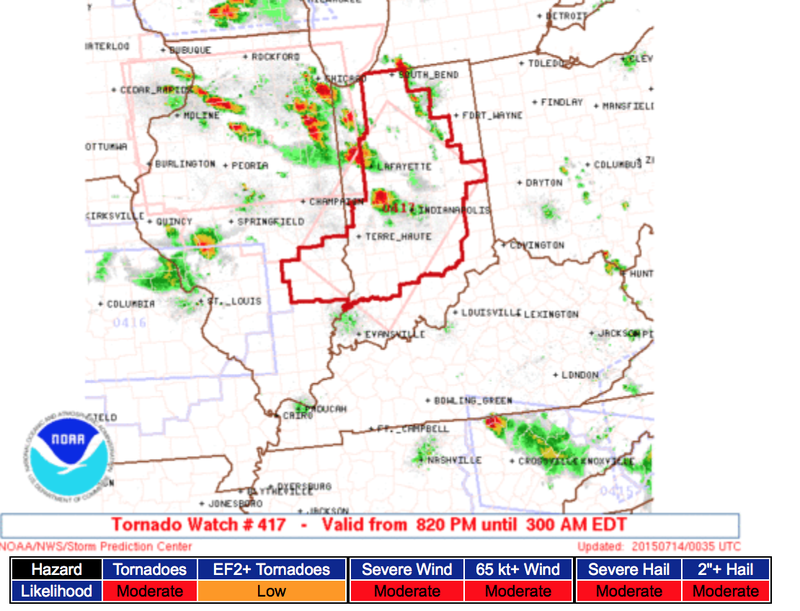 This is in effect until 3am EDT (2am CDT). 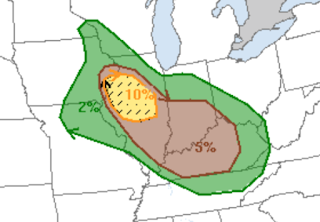 Tornadoes are possible well into the night because of the extremely unstable atmosphere. 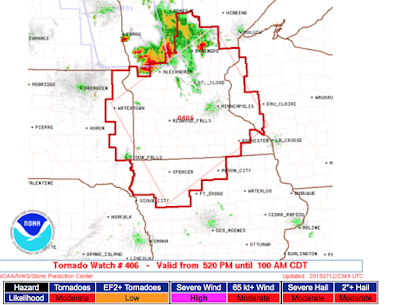 Please monitor the weather if you are in the watch. ...while I have been in Chicago on business, here is what things looked like from near my home pointed northwest. Summer tornadoes in Kansas with high cloud bases give many people the opportunity to see tornadoes for themselves from safe distances. So far, no damage other than uprooted trees has been reported. 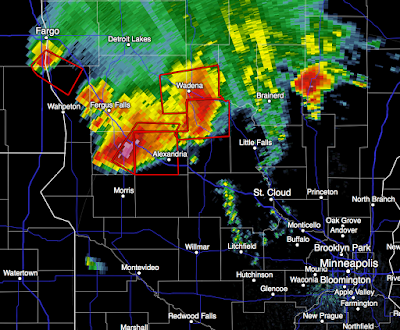 The storm near Ottawa, moving ESE, is showing signs of becoming tornadic. I will be tweeting storm coverage during the evening: @usweatherexpert. 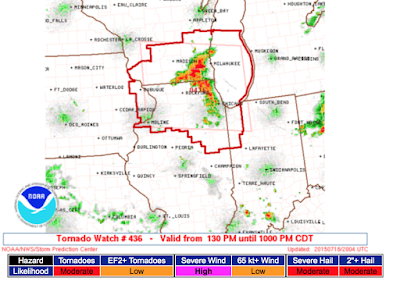 Tornado watch in effect for northern Illinois and adjacent parts of Iowa and Indiana. Thunderstorms are now developing and generally moving ESE or SE. Please keep an eye on the weather the rest of the evening. There's nothing to worry about. The thunderstorms were this morning. It is supposed to be a beautiful evening. 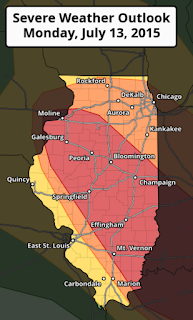 Chicagoland, and all of Illinois, are very much in the tornado/severe thunderstorm outlook for late this afternoon and tonight. The second reason it is so alarming is that is exactly the response given by a number of those caught unaware by tornadoes in the April, 2011, multi-day tornado outbreak that killed 355. 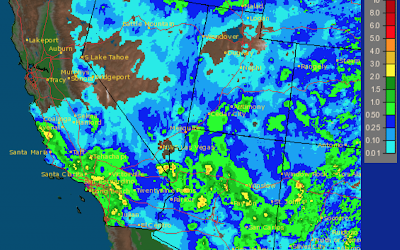 A line of thunderstorms went through the morning of the 27th. People thought the dangerous storms forecast for the afternoon had simply arrived earlier and they were in the clear. 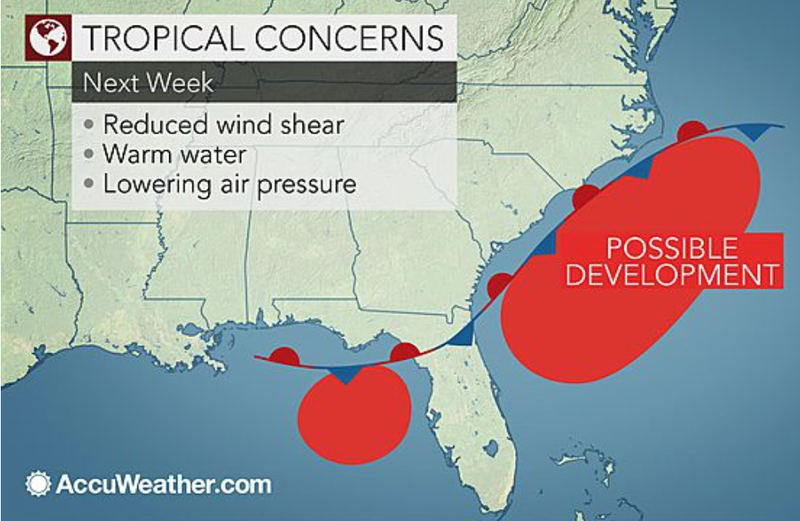 Unfortunately, the forecast was right on the money but people were unprepared because of that deadly assumption. We meteorologists believe we are clearly communicating the threats but, somehow, it get jumbled up in the translation. We have social scientists working with our science to help improve our messaging but it is obvious we have some work still to do. 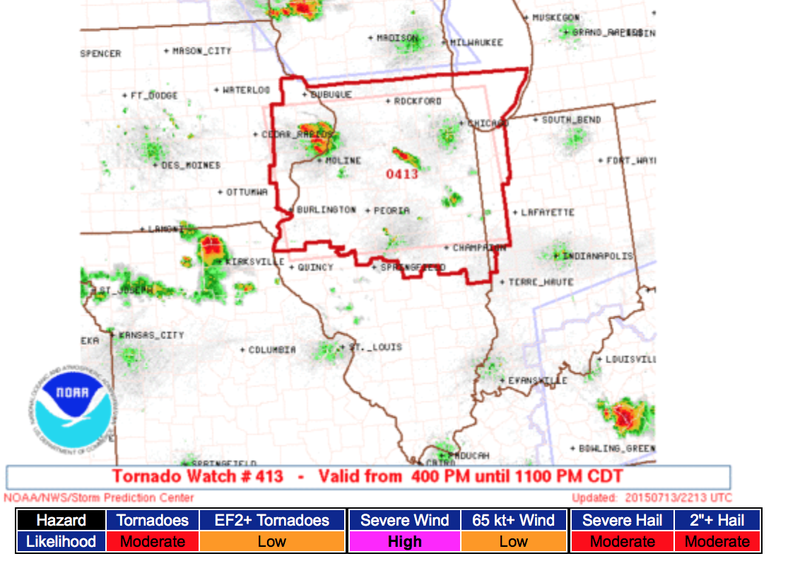 Bottom line: Chicago, pay attention to the weather after about 3pm through midnight. 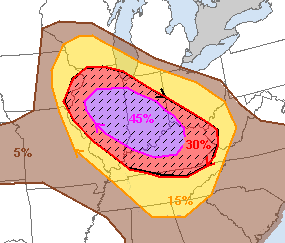 Unfortunately, the forecasts of a big severe weather day for today look like they are going to be correct. Five percent (brown) is the significant risk threshold. 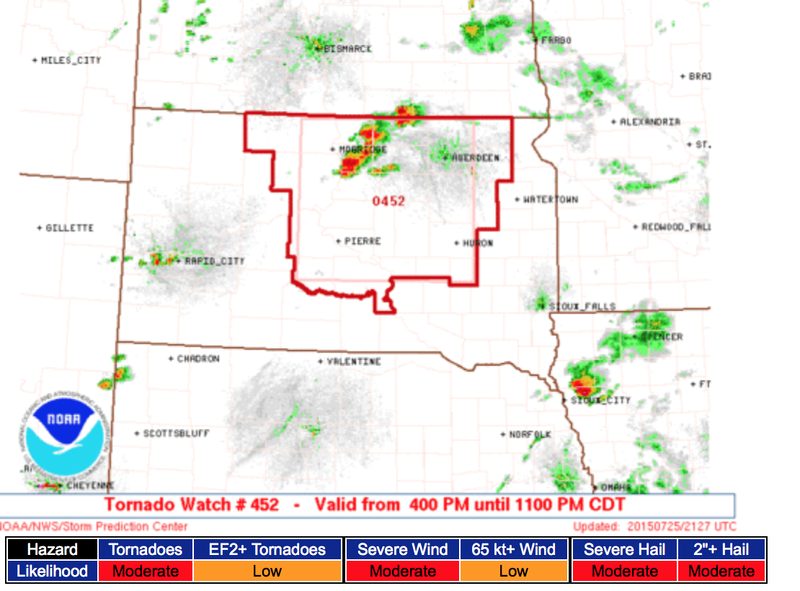 Where you see the hatching, violent tornadoes are possible. In this case, 15% (yellow) is the significant threshold. 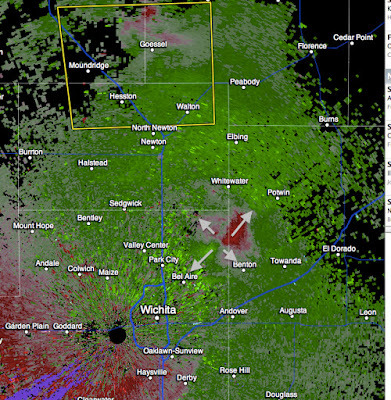 The hatched area is where wind gusts of 75 mph or stronger are forecast. So, this is certainly a day to keep up on the weather if you live in these areas. 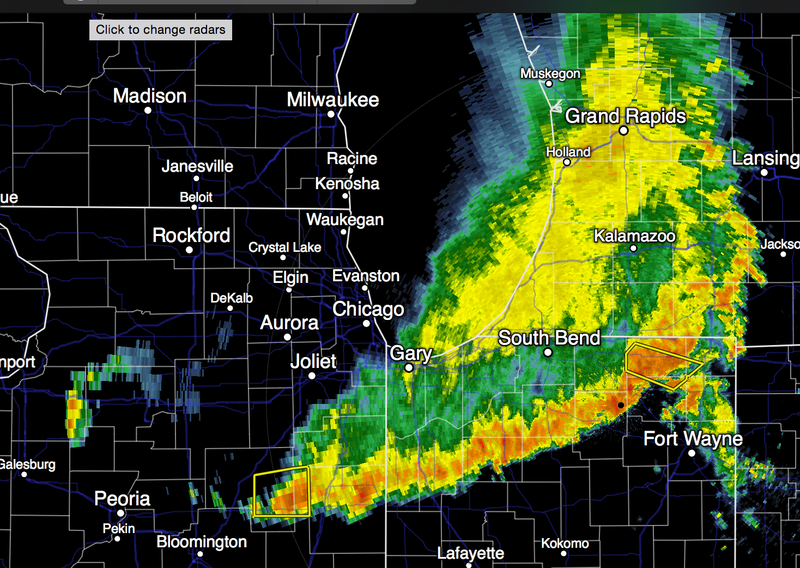 One line of strong storms with high winds is moving through the Midwest as of 8:45am. There are already major delays at O'Hare and Midway. 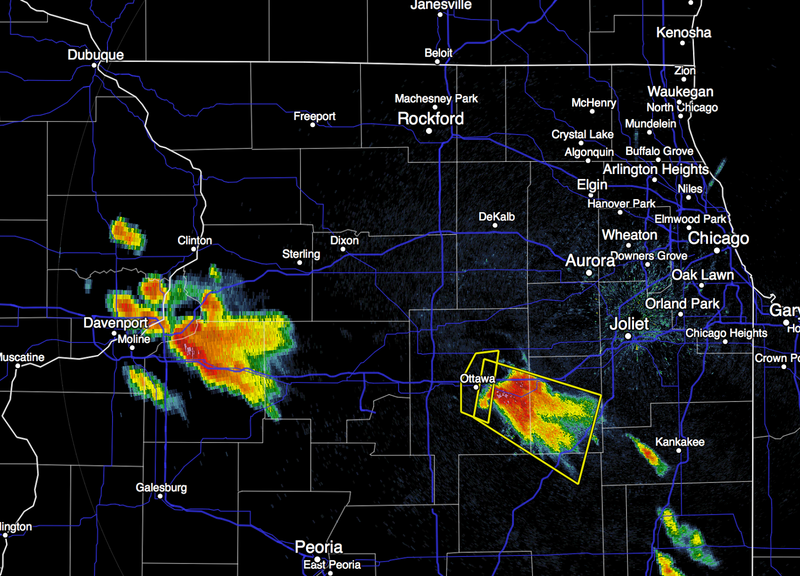 I will not be live-blogging the storms but will post periodic updates. "It Is Time to Eliminate the Department of Homeland Security..."
Here are the details from a person who spent nine years in the agency. 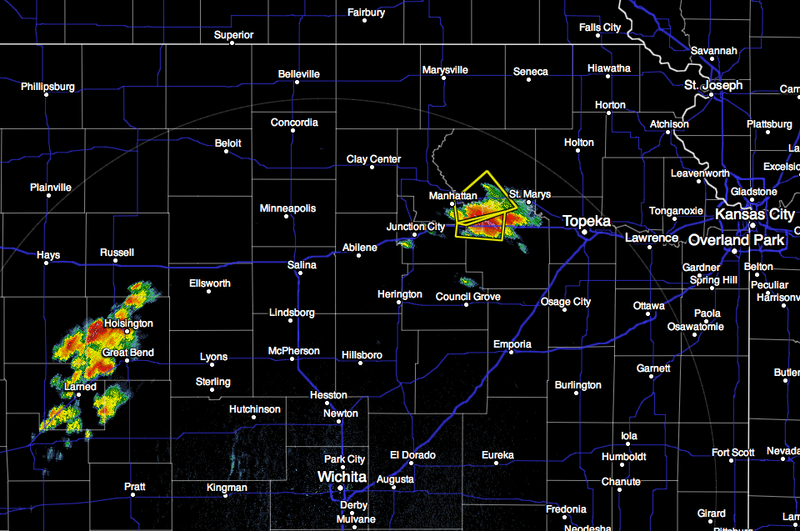 Here is the latest radar from the area at greatest risk. Multiple tornado warnings are in effect. 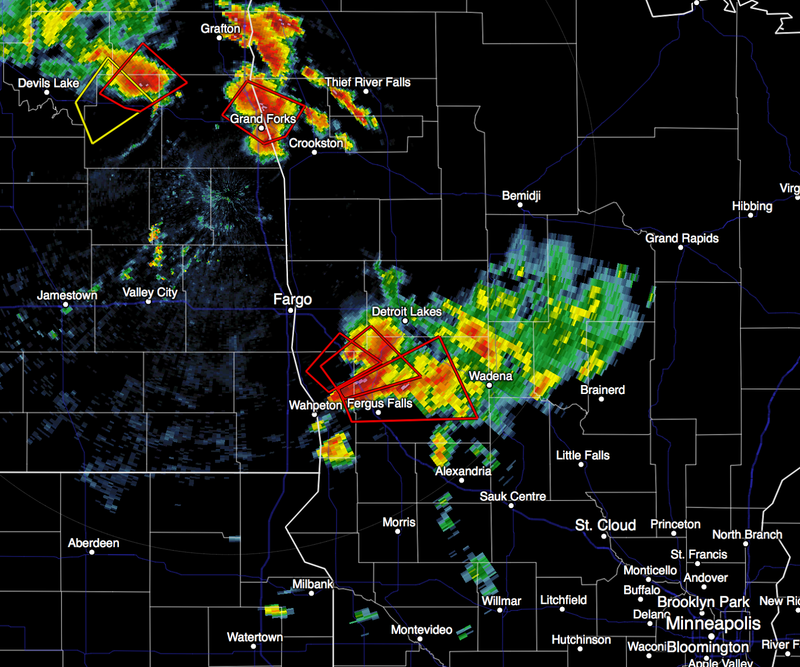 At 4:45pm, there are multiple tornado warnings in effect in North Dakota and Minnesota (red polygons). I urge you to take shelter if you are under a tornado warning. I will update at least one more time this evening. UPDATE 3:38PM. No sooner did I post this then the first tornado warning was issued. 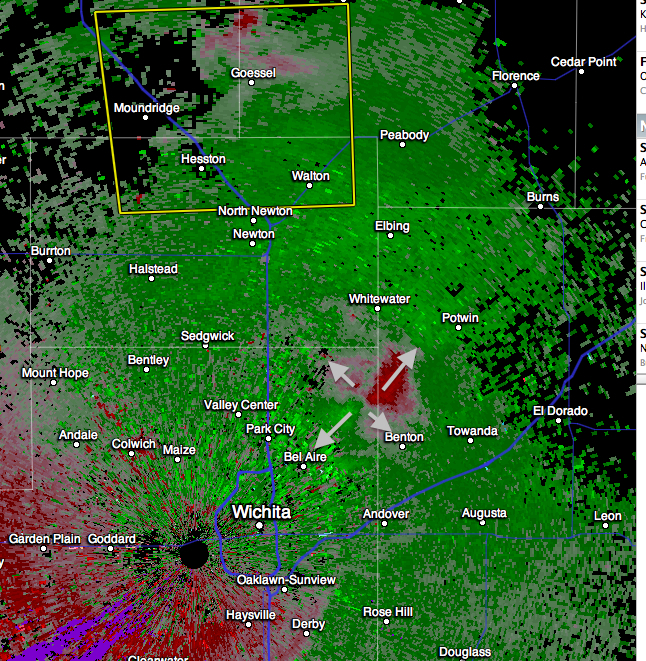 Please take cover if you are in the warning area. 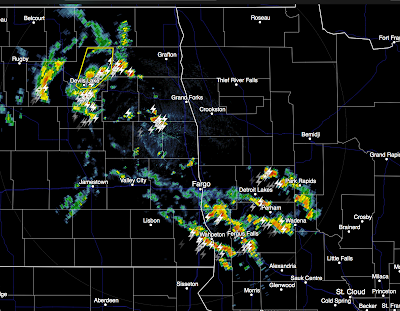 There is still a large, and growing, area of thunderstorms in eastern North Dakota and Minnesota. 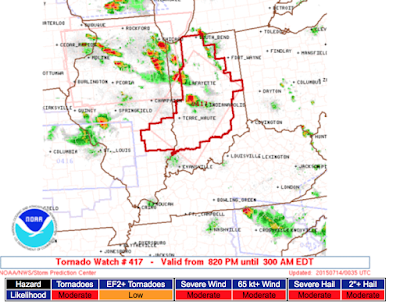 A severe thunderstorm watch has been issued for the northern area of storms as they move southeast. 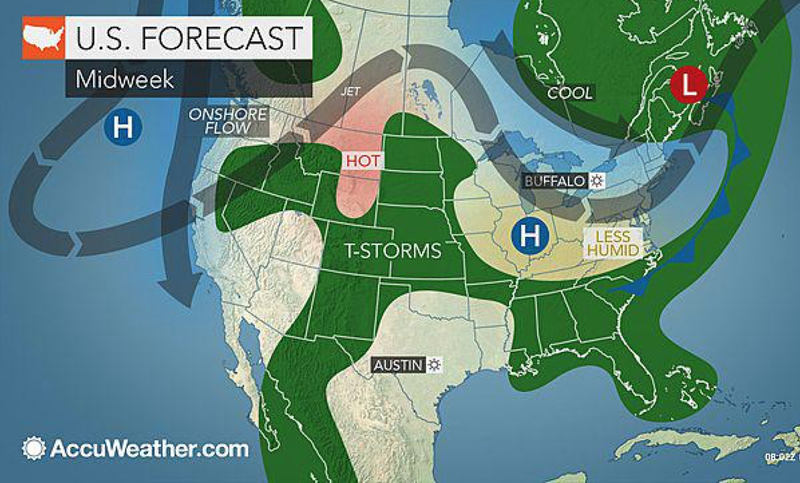 Gusts to 70 mph and three-inch hail are both forecast. 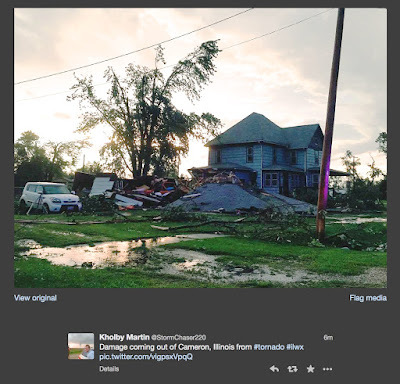 May, 2015, was a month of extreme flooding and moderate levels of tornadoes. In June, and the first few days of July, things calmed down. 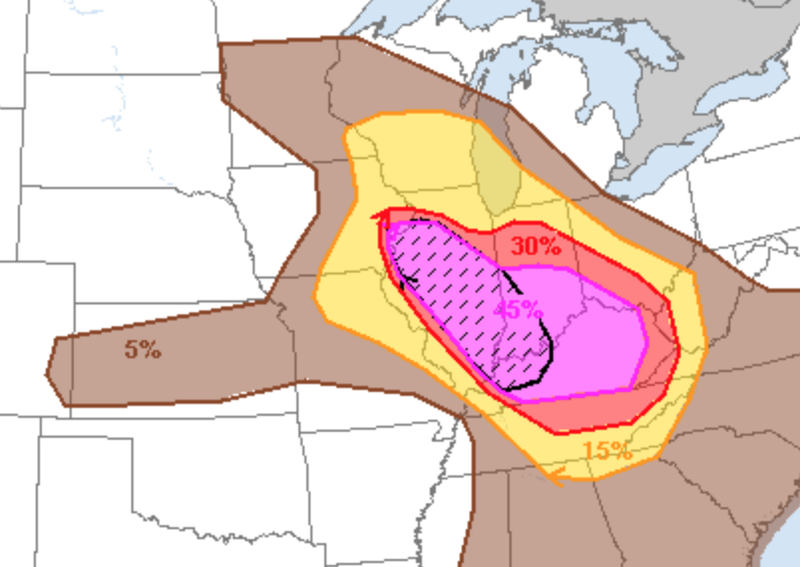 So, it may come as a surprise that major severe weather is forecast for later today and Monday by the Storm Prediction Center. The significant tornado risk (5%, brown) is relatively small. It does include the Twin Cities. 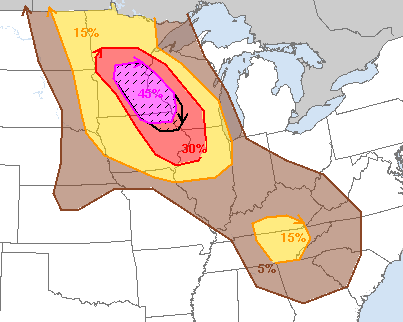 The biggest threat is damaging winds with gusts above 75 mph in the hatched area. There is a significant threat of gusts of 60 mph in the yellow areas. 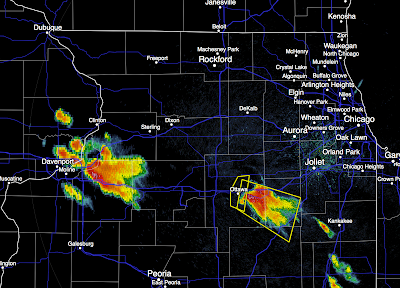 Large hail may accompany the winds in the northern region. This map combined the probabilities of the various severe weather threats (tornado, damaging thunderstorm winds and large hail) and it shows a high risk in the Midwest and Ohio Valleys. 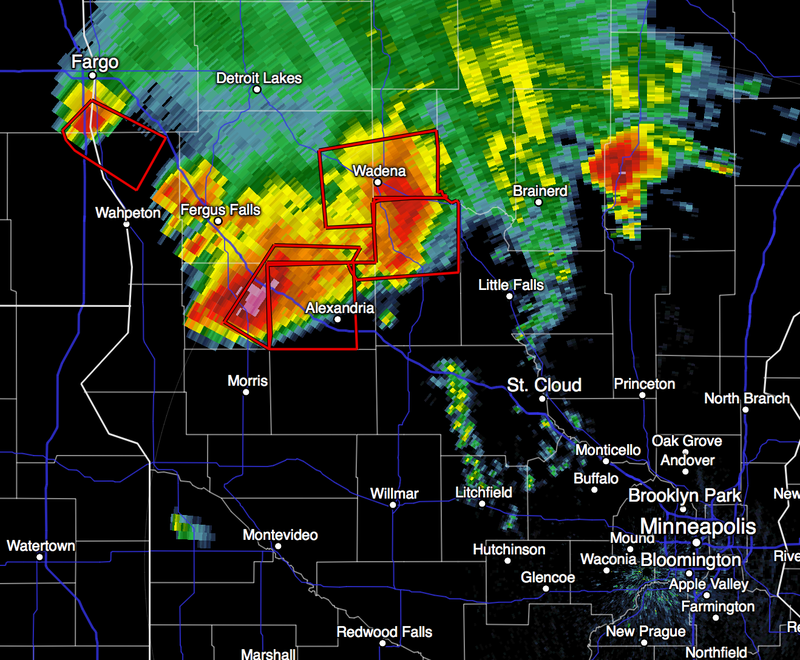 Have at least two sources of receive storm warnings. Make sure your dependents and friends are aware of the threat. Start monitoring the weather if you notice the sky begin to darken. Have fresh batteries for a flashlight, weather radio, etc. 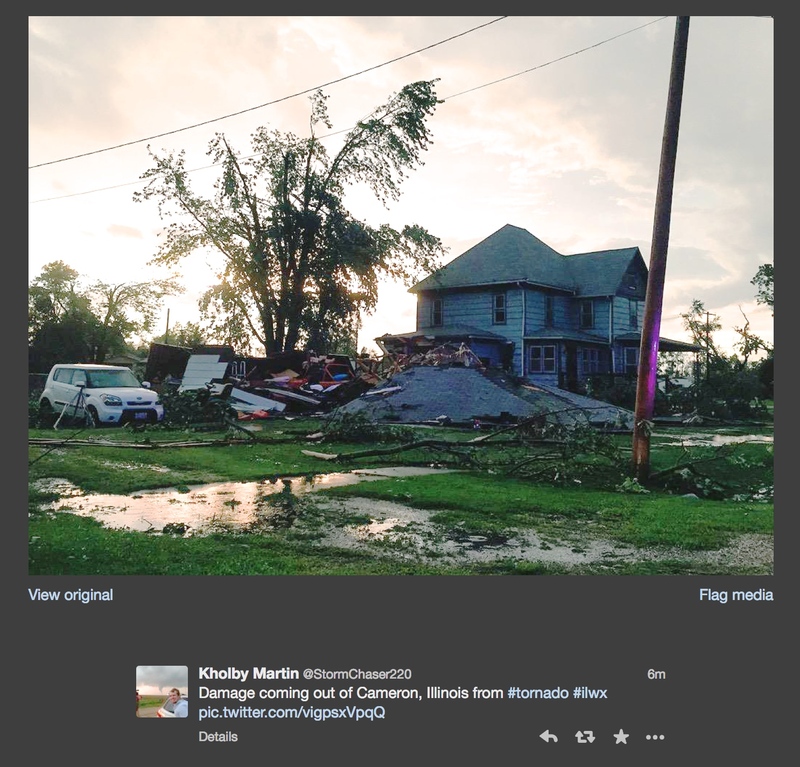 Keep your cell phone and computer charged but unplug them before the storm arrives. Put your car in the garage and bring in anything can be blown about. I will not be live-blogging the storms but will update periodically.